If you’re as obsessed with design magazines, you already know that the best homes that they feature tend to look as if their contents have been collected over time. While that may not always be the case, the overall feel is that years of effort and collecting went into finding just the right pieces to complement the space. As a result, these homes always look effortlessly layered, which gives them a casually professional and decidedly un-precious air. Though the best make it look easy, achieving this sort of lived-in vibe can be a challenge. Still, it's entirely possible to that same confident, world-traveled look in your own home just by making good use of your vintage pieces. In this new series, we’ll introduce you to the real workhorses of the vintage décor genre: The stuff that takes an ordinary room and instantly turns it into something amazing. And the really great thing is, they're never the pieces you'd expect. Out first stop: Vintage globes and maps. What better way to start giving your place a worldly feel than with pieces that bring the whole world in. These pieces are exceptionally interesting, colorful, and fully interactive—and they suggest a romantic wanderlust that will add layers to your décor. There's any number of ways to incorporate maps and globes into your décor. 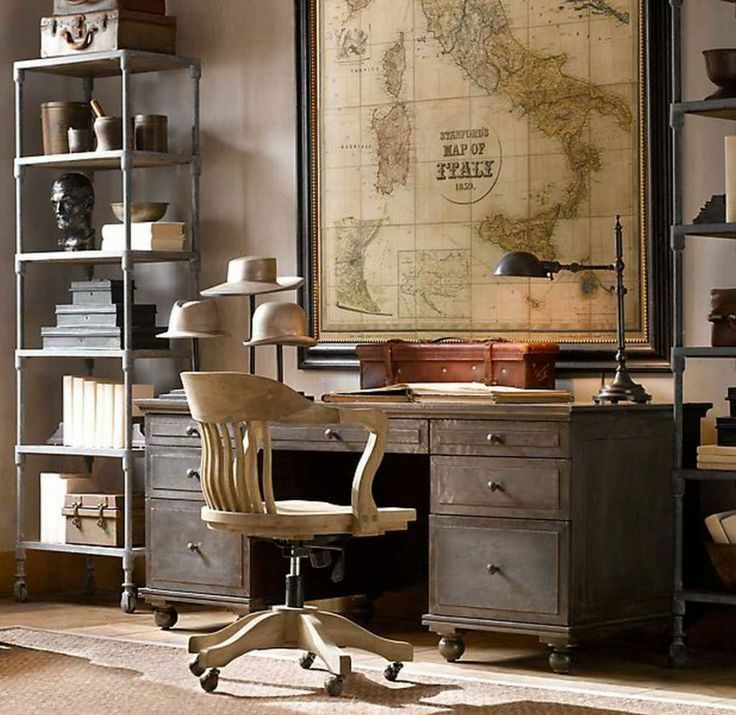 But if you're looking for something more than simply sitting them on a desk, here are 7 fantastic ways to decorate with vintage maps and globes. Even though we're looking for creative ways to use these pieces in our spaces they can still have a big impact just the way they are. In many cases, due to their large proportions and sculptural qualities, vintage maps and globes can make just as powerful a statement when left alone as they do in any other permutation. The interactive, changeable natures of globes make them natural décor darlings. To mix things up, explore globe groupings, play with height, and experiment with vignettes to determine how vintage maps and globes look best in your space. Then step back and take a quick pic to compare and contrast setups. Frame anything and instantly its look—and its worth—are elevated. We all know this goes for artwork, but maps, too, can earn pride of place once they’ve been framed (and in the right space, the larger the better). One interesting choice to make when framing a map is to splice one large map evenly, in two-to-three places then frame the pieces separately in luxe frames, thus creating a grand gallery wall. Wallpaper comes in all forms, and you needn’t discount a vintage map as a viable option for covering your walls. But you can do more than cover large swathes of wall space with an oversized atlas. Create an ingenious faux-headboard, paper the backs of bookshelves or dresser-drawer fronts. Closets, cabinet fronts, and even kitchen backsplashes are all places to consider vintage maps as a visually impactful decorative device. Wallpapering projects are best handled by a professional hanger, but there are also some great, easy recommendations for DIY experts or anyone feeling especially industrious. Upcycling vintage maps for custom roller-shades and window treatments is refreshingly irreverent, and super-clever. Map-shades look charming (as well as educational) in kids’ rooms. They do equally well inside smaller spaces that could benefit an injection of color and/or pattern but don't offer many surface options. One suggestion: steer clear of overusing maps in adult bedrooms or any room where you’d like to express a modicum of relaxation and serenity. To decoupage something means to decorate it with paper cutouts. The process is very simple, too, though there are a few methods to consider, depending on your surface. There are virtually hundreds—perhaps thousands—of surfaces just begging for a revamp. Think wooden tabletops, plastic coasters, picture-frame mats, metal boxes—even chairs! Again, vintage maps imbue that storied vibe we’re all seeking to elicit, and the decoupage technique is a great way to give a boring object instant significance. Because vintage globes are spherical, turning one into a pendant lamp seems like a natural progression. Slice one in half for two twin specimens that hang side by side or cut a little lower for a single light with a more complete world view. Tip: Punch holes in the places you’ve visited, allowing light to filter through in unexpected places while adding another layer to your decorative story. One way to make your next children’s party a bit chicer is to bring in décor elements that will work just as well for your next cocktail party. Once considered a serious décor faux pas, garland—especially of the handmade variety—has made a big comeback. Paper maps can be folded, trimmed, and cut into decorative shapes and bunting to festoon walls, stair railings, and more. Vintage maps and globes can be found in any number of places. Thrift stores, antique shops, tag sales, and auctions are eager to unload them as fast and often as possible. Because the world, and more specifically the names of different countries, changes so quickly, maps and globes often find themselves suddenly obsolete, making them a steal for design-loving geography buffs. Some of the best places to find what you're looking for include websites such as 1stDibs and auction houses such as Christie’s, Bonhams, Skinner and Sotheby’s. Each of these renowned houses periodically has either a dedicated sale of vintage maps, atlases, and globes, or features a collector’s specimen or two in many of their regular auctions. Of course, it's also a good idea to check out the larger flea and antique markets such as the Brimfield Market in Connecticut. If all else fails, eBay and Etsy are the online go-tos for anything hard to find. Finally, services like Murray Hudson and The Old Print Shop not only offering prints, globes, and maps but will even help you determine the age of pieces purchased through other sources – the latter has been buying and selling maps for more than 100 years and offers vintage and antiquarian maps by categorized by price, continent, body of water, and even by state. Allegra Muzzillo is the owner and proprietress of the Brooklyn-based boutique, You & Yours Fine Vintage. This design maven has been a writer for Real Simple and Cottages & Gardens.